What is OPT Perfect Pulse System? The perfect OPT core technology (Optimal Pulse Technology) uses 3D technology concepts: Energy + pulse width + pulse waveform. The word, OPT perfect pulse technology may be relatively unfamiliar to most people, in fact, OPT technology mainly makes a great improvement in the hardware, and the core is to accurately control each pulse, and each pulse energy without attenuation applies on our skin, and the perfect pulse energy is also formed due to the elimination of E light and IPL first-pulse high energy peak value, as well as the elimination of the technology disadvantage that Second pulse width energy attenuation one by one, which makes OPT have significant improvement in the treatment effect, especially in the aspects of freckle removal, hair removal and skin rejuvenation. It has a good function in improving skin texture and narrowing pores, so it is a real sense of the skin rejuvenation technology, and the more important is the improvement in treatment safety and avoiding the skin burns and other side effects during the past IPL treatment. It can really ensure that the whole energy output is steady and uniform, the fully intelligent control software, and the pulse intense light skin rejuvenation, pigmented lesions and vascular treatment are integrated into one machine, and once OPT treatment is equivalent to 2-3 times of the traditional treatment technology. Sapphire cooling technology has greatly improved the safety and effectiveness of the treatment. It is a new breakthrough of the IPL technology after four generations of development. Square wave OPT technology, i.e. perfectly controllable intense pulsed light technology, is the latest generation of pulse technology. 1. Hair removal: permanent hair removal, indecent hair (hair in growing period) throughout the body, including lightly colored fine hair. 2. Freckle removal: Get rid of freckles, sunburn, age spots, acne print, facial defects. 3. Skin rejuvenation: Improving the coarse pores, rough skin and dark complexion, so that the skin is white with uniform color, and the skin elasticity is restored. 4. Acne removal: whelk, acne print. 5. Improving telangiectasia: red blood streak and facial flushing. 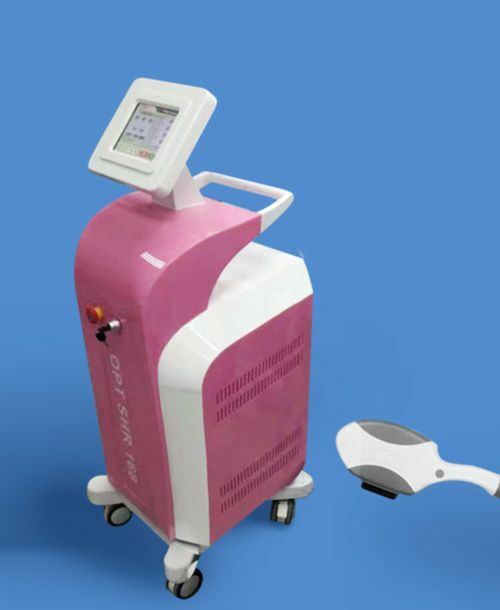 OPT photon hair removal principle is to use strong pulsed light with a wide spectrum of 610-1000nm, and there is wide adjustable pulse range, therefore it can make permanent hair removal for hairs at various parts of the human body with different colors and different depths. Hair removal technology is generally considered to have hair follicles produce heat by using melanocytes in hair follicle to absorb the light with a specific wave band through selective photothermolysis principle of patented intense pulsed light source, so that the selective destruction is made to the hair follicles. At the same time, the heat emitted is transmitted to the deep of the hair follicle through the cross section of the hair stem, so that at the same time of increasing hair follicle’s temperature rapidly, the damage to surrounding tissues can also be avoided, and the hair follicle is unable to regenerate, so OPT photon hair removal can realize permanent hair removal effect.